What is patch management and patch policies? Datto RMM patch management allows you to both control and automate the deployment of patches to your Windows devices. The main objective of patch management is to create a consistently configured environment that is secure against known vulnerabilities in the operating system. Patch management is controlled in accordance with a device's patch status through policies at the Account and Site level, while individual patch installations can be configured at the Device level, permitting exclusions or tolerances for individual patches without needing to alter entire policies. Only Windows Managed Agents support patch management. Refer to Managed and OnDemand Agents. If you would like to use a patch management policy to install only the patches you have approved, and to make sure that the patch management process is not interfered with, you need to disable Automatic Windows Update on your devices. We recommend that you create a Windows Update Policy in Datto RMM to achieve this. For more information, refer to the Disable automatic Windows Updates section of Create a Windows Update policy. Devices submit their audit data to the platform. The information includes patches that Windows Update requires. The platform runs the devices' required patches as defined by Windows Update through the patch management policies that target the devices. These policies can be Account- or Site-level policies (including Site-level overriding of Account-level policies). The policy filters will define which patches get approved or disapproved. Refer to Create a Patch Management policy. Individual patch installations (approvals or disapprovals) at the Device level are also taken into consideration. Refer to Patch management at the Device level. The final approval list is sent back to the devices, which then either download the patches directly or contact the Local Cache(s) for the patches during the defined patch policy window. For information on the order in which patches are installed, refer to Order of patch installations. Depending on the patching operation you would like to initiate at either the Account, Site, or Device level, various permissions are required. For further information, refer to the tables below. To learn how to configure the permissions, refer to Security levels. Create or Edit an Account-level patch policy Account > Policies: Manage Users without Manage permission who are viewing Account-level patch policies will see everything, but all configurable options will be disabled. It is for reference only. The Save button at the bottom of the policy is not displayed. Push the changes of an Account-level patch policy from the Policies tab Account > Policies: Manage Without permission to manage Policies: Push changes... button is not displayed. • Account > Manage: Manage • Without permission to manage Policies: Push changes... button is not displayed. • Without permission to manage Manage: Push changes... button is not displayed. • Without permission to view Manage: Manage tab is not displayed. • Account > Manage: View • Without permission to view Manage: Manage tab is not displayed. • Without permission to view Policies: Patch Management section is not displayed on the Manage tab. • Account > Manage: View • Without permission to view Policies: Patch Management section is not displayed on the Manage tab. • Account > Manage: Manage • This also applies to the per-site options when clicking on the Target icon. • Without permission to manage Policies: Enabled toggle is grayed out. • Account > Manage: Manage • Without permission to view Policies: Patch Management section is not displayed on the Manage tab. • Without permission to manage Policies: Run now icon is grayed out. • If a patch management policy is used for audit only, the Run now icon is grayed out. Refer to TIMING OPTIONS. • Account > Manage: View Permissions to view and manage Manage are only required when performing actions from the Manage tab. The user can conduct the same actions via the Policies tab without those permissions. Account-level policies shown at the Site level will require Manage permissions on the Account level to edit, and View permissions to view, regardless of where they are being seen from. This applies to both the Manage and Policies tab. View an Account-level policy that is being overridden at the Site level Sites > Policies: View The Override/Edit Override button here reverts to View Override if the user only has view permission. Policy options in this case will be visible but disabled. Users here are not editing the Account-level policy so do not require permission to manage Account > Policies. View an independent patch policy (that is not overriding an Account-level policy) Sites > Policies: View All configuration options are set but disabled, and the Save button is not displayed. All restrictions specified at the Account level apply here as well. • Sites > Manage: View • If the user has no permission to view Policies or Manage, the Patch Management section is not displayed. When clicking on the Manage tab, the user will be redirected to the next management option. • If the user has permission to view Account > Policies but does not have permission to view Sites > Policies, the Site Policies section is not displayed at the bottom of the page. The section called 10 Most vulnerable devices in terms of Approved Pending Changes is always displayed on the top right of the page and will show policy names. • If the user has permission to view Sites > Policies but does not have permission to view Account > Policies, only independent Site Policies are shown at the bottom of the page. The section called 10 Most vulnerable devices in terms of Approved Pending Changes is always displayed on the top right of the page and will show policy names. Push the changes of an Account- or Site-level patch policy Sites > Policies: Manage Without permission to manage Policies: Push changes... button is not displayed. • Sites > Manage: View Permissions to view and manage Manage are only required when performing actions from the Manage tab. The user can conduct the same actions via the Policies tab without those permissions. Nominate a device as a Local Patch Cache, or re-configure nomination settings Refer to Designate a local cache. Approve or unapprove a patch at the Device level Sites > Manage: Manage Without permission to manage Manage: the user cannot perform actions on the page. View device activity Refer to Device activity. 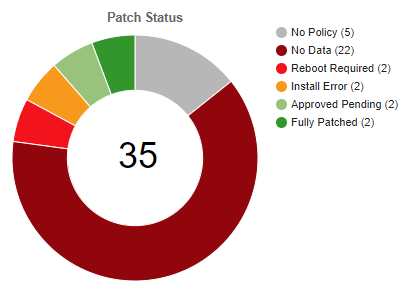 By default, the pie chart shows the patch status of all Windows devices at the Account or Site level. The number of devices of each patch status is shown in brackets. When a filter is applied on the page, the pie chart is automatically refreshed. To learn about the patch status process flow, refer to Determining a device's patch status. For further information, refer to Action bar icons. Account Policy / Policy Select a patch management policy. Account-level policies are listed at both the Account and Site level, while Site-level policies are only listed at the Site level. By default, no policy is selected. • All Windows - Selected by default. • All - Selected by default. Search Enter any text and click Search to narrow the results. For further information, hover over the Search Help icon next to the Search button. The values for the Patch Status, Patches Approved Pending, Patches Installed, and Patches Not Approved fields are updated at device audit time. With the exception of the Policy, Last Run, and Schedule columns, click any of the column names to sort the data. By default, the devices are sorted by the Patches Approved Pending column. Device status icon Shows the online / offline status, privacy status, and network node status of the device. Site Name The name of the site that the device is associated with. Click the hyperlink to open the Site Summary page. Refer to Site Summary. Policy The name(s) of one or more patch policies that target the device. Click the hyperlink to open the policy. Refer to Create a Patch Management policy. It is not recommended to have more than one patch policy targeting a device. Last Run Date, time, and time zone when the patch policy or policies last ran. Schedule The schedule(s) of the patch policy or policies. Policies with an overridden schedule show the overridden data, not the original data. Patch Status The patch status of the device. Patches Approved Pending The number of approved pending patches. The device with the highest number is listed first. This section displays the list of patch management policies created at the Account or Site level. Account-level policies are listed at both the Account and Site level, while Site-level policies are only listed at the Site level. You can collapse or expand each list. Override active Only appears if the Account-level policy in question is overridden at the Site level. To edit the override, locate the policy at the Site level. Refer to Override Account-level patch policy options at the Site level. Policy The name of the patch policy. Click the hyperlink to edit the policy. Refer to Create a Patch Management policy. Targets The targets of the patch policy. Last Run Date, time, and time zone when the patch policy last ran. Schedule The schedule of the patch policy. Policies with an overridden schedule show the overridden data, not the original data. Push Changes... Click Push changes... to immediately push any policy changes to all devices targeted by the policy. The target icon changes color when changes are being pushed. Actions • Hourglass - Allows you to view the results from the last time the policy ran. If the policy has not been run, the icon will be disabled and not clickable. Click the icon to open a window showing the Last Run Time and the following Patch Information: Patch Description, Download Size, Targeted Devices, Successes, Failures. Click the hyperlinked number under Successes and Failures to see more details. If you are viewing an Account-level policy, then the hyperlink will direct you to the list of affected sites. You can expand each site to see the results for the targeted devices. If you are viewing a Site-level policy, then the hyperlink will direct you to the list of targeted devices. On the Successes and Failures page, you can control the items per page view and you can search for your devices. You can also filter by Desktops, Laptops, Servers, or All devices. • Calendar - Allows you to see what patches would be installed if the policy was run now. Click the icon to open a window listing all Approved Pending Patches. At the Account level, the patches listed are from all sites in the account. At the Site level, the patches listed are from that particular site only. The patches listed reflect the last audit data. Devices show data from all policies targeting them. You can expand or collapse each patch to see further information. You can control the items per page view and you can search for your devices. • Target - Click this icon to open a window listing included and excluded sites and/or devices targeted by the policy. The Override active icon is displayed in front of sites that override the Account-level policy options. You can filter by All Sites, Included Sites, and Excluded Sites in the case of Account-level policies, and you can also filter by All Devices, Included Devices, and Excluded Devices in the case of both Account- and Site-level policies. You can turn the policy on or off for your sites and devices by toggling the Enabled button to ON or OFF. You can push the changes by clicking the Push changes... button. The target icon changes color when changes are being pushed. • Run now - Click this icon to open a dialog box where you can confirm whether you want to run the policy now, outside of its schedule. If the policy has been deactivated, or used for audit only, the icon will be disabled and not clickable. Account-level policies will run on all targeted devices in the account, while Site-level policies will only run on targeted devices in the site in question. If a device is offline at this time, the policy will run on it when it next comes online. For information on the Audit only option in a patch policy, refer to TIMING OPTIONS. If you have just made changes to your policy, we recommend that you wait five minutes before you click the Run now icon to ensure that the changes have been applied. Enabled / Enabled for this site A toggle to turn the policy ON or OFF. You can configure individual patch installations at the Device level, permitting exclusions or tolerances for individual patches without needing to alter entire policies. Service Pack The Service Pack Installed on the device. Policies The patch policies that target the device. • Name - The name of the patch policy. Click the hyperlink to edit the policy. Refer to Create a Patch Management policy. • Last Run - Date, time, and time zone when the patch policy last ran. • Schedule - The next run time of the patch policy. Policies with an overridden schedule show the overridden data, not the original data. • Run Now - Click the icon to run the policy on this device now, outside of its schedule. If the policy has been deactivated, or used for audit only, the icon will be disabled and not clickable. If the device is offline, the policy will run on it when it next comes online. • Filter - You can filter by Microsoft Security Response Center Priorities (Critical, Important, Moderate, Low, Unspecified), May Require Reboot, and May Require User Input. For more information on Priority, refer to Filter patches. • Search - As you type into the dynamic search field, the search results are narrowed to match your search string. • Sort - You can sort the patches by clicking on any of the following columns: Title, Microsoft Security Response Center Priority, Download Size, Reboot behavior. • Patch title - Click the hyperlink to open a page showing all devices for which this patch has been approved / that have this patch installed / for which this patch has been denied (when clicking from the Approved / Installed / Not Approved list, respectively). • Click for more information - Click the icon to display further information about the patch. Further details of each drop-down list are discussed below. This drop-down denotes patches that have been marked for approval on this device by the Site- and/or Account-level policies targeting it. The number of patches is displayed in brackets next to the list name. The list is only updated following a device audit. Patches that are approved are pushed to the device during the policy schedule window, and following their installation, are moved to the next list called Installed. The policy schedule and other settings can be changed in the patch management policy. Refer to Create a Patch Management policy. • Remove from list - Hover over the patch and click this icon at the end of the row to move the patch to the Not Approved list. This drop-down denotes patches historically approved for this device, either by policy or as a result of user intervention. The number of patches is displayed in brackets next to the list name. The list is only updated following a device audit. This drop-down denotes patches that have not been approved by the policy targeting the device. The number of patches is displayed in brackets next to the list name. You can add patches to this table by clicking on the Remove from list icon next to a patch in the Approved list. To remove the patch from a device and stop it from re-installing, it must be excluded here and then removed manually using the Uninstall Windows Update by KB Number component from the ComStore. Refer to ComStore. • Remove from list - Hover over the patch and click this icon at the end of the row to move the patch to the Approved list. If you have a device with no patch policies targeting it, all patches that Windows Update required in the last patch scan will be listed in the Not Approved drop-down. This is the expected behavior as no policy was able to approve these patches. If you then target this device in a patch policy, the device will need to be re-audited before the patches can move to the Approved list. To learn about the frequency of audits and how you can perform a manual audit, refer to Audits. A Datto RMM device’s patch status is determined and represented by the platform based on a sliding criteria evaluation against the device’s last audit data submission. 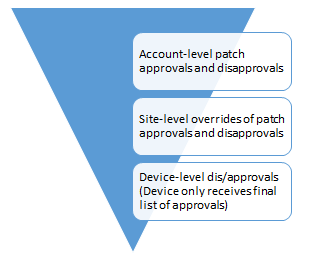 The platform evaluates each device’s patch data submission on a true or false basis of each possible status, as outlined below, in descending order. The first such status that is true will be the device's patch status until the next audit is submitted when the same process will take place to ascertain the device’s patch status at that time. No Policy - The device is not targeted by any patch policy. No Data - No patch audit data is available. For more information, see the process flow and explanation of steps below. Reboot Required - The device requires reboot. Install Error - One or more errors were encountered during the most recent patch installation run. Approved Pending - The device has approved pending patches. Fully Patched - The device is fully patched. For example, if a device is targeted by a patch policy and has patch audit data available but it requires reboot, has install errors and approved pending patches, its overall patch status will be Reboot Required as that's the first item to return a true value in the check results. In order to understand the above more clearly, it is important to understand the process that takes place during a device audit: how patch information is gathered and how that information is analyzed to determine the overall patch status for an individual device. The following process flow and explanation of steps has been designed to help you assess and determine why a particular status (e.g. No Data) has been determined for a particular device. A device must be targeted by a Patch Management policy. Without a policy assigned, the platform will always determine the status of the device as No Policy. An audit is carried out on the device. By default, it's initiated by the Agent but it can also be requested manually. For more information, refer to Frequency of audits. After the Windows Update API has been called, the control for patch scanning and the resultant compiled data set is passed over to the operating system and its Windows Update Service. The Datto RMM Agent audit process will now wait as long as it takes for this scan to be completed. 4.1. Windows Update will perform a scan for all software and drivers relevant to the OS and any installed applications supported by Windows Update. It will ask its configured source server for any pertinent software or driver information to be returned. By default (standard), a Windows operating system contacts Microsoft’s Update Servers for information about available updates and hotfixes for the enquiring device. However, a device can be configured (custom) to use a WSUS server or Microsoft’s own Intune service to retrieve updates and hotfixes. This will alter the source that the device connects to in order to retrieve such update information and may often differ from the information returned using Microsoft’s standard update servers. Therefore, it is very important to understand which source server devices are querying when running their patching enquiries. A device can only be configured to contact one source for its updates. If the Windows Update Service itself is disabled on a device, the query will fail and no information regarding patch data will be returned from the enquiry (i.e. the device's patch status will be No Data). 4.3. Based on the outcome and health of the information returned from the Windows Update enquiry, we can categorize the result as being Successful or Failed. A successful enquiry is the result of a good connection with the device’s configured source server and a successful completion of the software and driver enquiry it asks of that source. Successful completion constitutes that the Windows Update Service was enabled, the enquiry was completed, and no errors were returned. It is a Windows 10 device that has been recently installed with the latest available Feature Update. Because of the nature of Windows 10 Feature Updates, all former patch history is removed and there may be no updates applicable for installation from Microsoft until the following month. As such, no patch data is returned from the enquiry and the device will have a patch status of No Data. The source WSUS server is not presenting any applicable patch data to the enquiring device. This is most likely due to a misconfiguration or a fault with the WSUS server. The device will therefore have a patch status of No Data. The WSUS source server and its configuration should be assessed and addressed accordingly so as to provide information to the device when it requests patch information data. 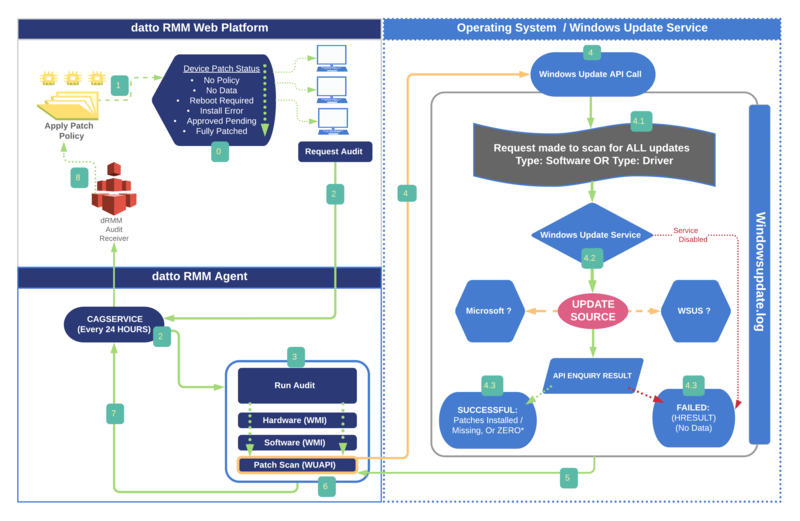 In the majority of these circumstances, an HRESULT error is thrown by the Windows Update Service and recorded by the Datto RMM Agent in the device’s activity log. Windows Update error codes are, unfortunately, numerous and not always easy to decipher. Because they are not under the control of the Datto RMM Agent, should such errors occur, we recommend researching the particular error with a view to employing a suitable resolution to address the issue and resume standard Windows Update behavior. All information and activity of the Windows Update Service is captured in the operating system’s WindowsUpdate.log file. For more information and how to read and analyze the log, refer to this Microsoft article. The patch scan is completed and the result, along with its associated data, is passed back to the Datto RMM Agent. The audit process is completed and all data is compiled for submission to the platform by the Datto RMM Agent. The device audit data is sent to the platform. The platform evaluates the device's audit data against the patch policy applied to the device to determine the device's patch status. To see detailed information about patch installations, check the device activity log and patch management reports. Refer to Device activity and Report scheduler.